Who Will You Nominate for The FD200? 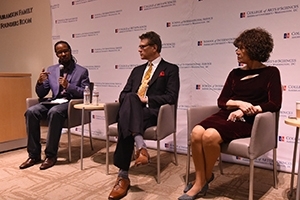 You are here: American University Media Relations News Antiracism Center Announces "The FD200"
Celebrating the Bicentennial of Abolitionist Frederick Douglass Antiracist Research and Policy Center Announces "The FD200"
Prof. Ibram X. Kendi with Robert Benz and Nettie Washington Douglass of Frederick Douglass Family Initiatives. Washington Douglass is the great, great granddaughter of Frederick Douglass. To honor and celebrate 19-century abolitionist Frederick Douglass during his bicentennial, American University's Antiracist Research and Policy Center has teamed up with Frederick Douglass Family Initiatives for "The FD200." Throughout the year, 200 people whose modern-day work best reflects Douglass' legacy will be named and honored as part of "The FD200." Honorees will fall into one of seven categories that reflect the immense character of Frederick Douglass: abolitionist, writer, politician, feminist, educator, entrepreneur, and diplomat. "Douglass was a transformative figure in American history. The efforts of many change agents today-regarding racial justice, human rights and gender equality-will have a transformative effect on the future of the United States and on the world," said Ibram X. Kendi, founding director of The Antiracist Research and Policy Center and National Book Award-winning author of Stamped from the Beginning: The Definitive History of Racist Ideas in America. "We want to recognize those change agents as the most critical legacy of Frederick Douglass." The Antiracism Center has launched a campaign to solicit award nominations from the public. Award announcements will begin on Juneteenth, the celebration that commemorates the June 19, 1865, announcement of the abolition of slavery in the U.S. There are also plans to educate youth on how the honorees' work exemplifies the spirit of Douglass, and The FD200 will culminate in a gala in October to honor the awardees. On Feb. 14, 2018, the 200th birthday of Douglass, the Antiracism Center and FDFI hosted a gathering to announce The FD200. Two descendants of Douglass and co-founders of FDFI, Nettie Washington Douglass, and her son, Kenneth B. Morris Jr., attended. They hold the unique honor of tracing their lineage to Douglass as well as Booker T. Washington, black American leader and author, educator, and orator of the late 19th- and early 20th-centuries. Nettie Washington Douglass is the great, great granddaughter of Douglass and great granddaughter of Washington. For more information about the Antiracism Center and to stay up-to-date on the latest news regarding The FD200, please visit the center's website and follow on Twitter and Instagram (@AntiRacismCtr).